Yes, boys and girls, it’s time for Yet Another Twitter Post™, the unofficial Macworld series in which we write about all things Twitter until you’re blue (or, for bonus points, any other color) in the face. 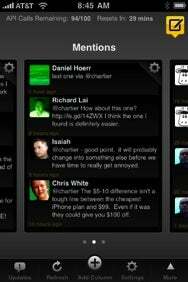 This time around we have TweetDeck, a unique desktop Twitter client that has finally made its long-awaited leap to iPhone and iPod touch. TweetDeck is a free Adobe AIR app for Mac and Windows, and its claim to fame is the ability to organize the users you follow into arbitrary groups. If you can get past the knee-jerk groans that AIR typically induces in anyone who prefers quality software, these “social dashboard” features can be useful for both power users and casual Twitterers alike. Want to follow more Twitter news feeds like @Macworld and @CNN, but don’t want them cluttered in with your friends? Add them to a group called, say, “News,” and you’ll see just those users in a column next to your main list of tweets from friends. You can close a group to avoid the distraction, and create as many groups and columns as you want for things like Twitter search terms, trending topics, your replies or direct messages, those clever tweeters that you don’t want to miss, and more. TweetDeck for iPhone scrunches these group and column features into a clever package for Apple’s mobile devices. Most of the basic tweeting tools are here, including sharing photos via a variety of services and updating your Twitter profile with your location. But TweetDeck for iPhone also adapts Mobile Safari’s page/tab interface for your Groups, allowing you to swipe left and right to swap between columns. A “columns” button also provides a MobileSafari-like zoomed out view of your columns, making it easier to keep your bearings if you get lost in your groups. From the zoomed out view, new columns can be created, customized, and organized for most of TweetDeck’s core features, such as Twitter keyword searches, groups, and your mentions. Severe addicts can even even specify a refresh interval for each column, starting at 20 seconds and reaching up to 2,000 seconds. If you’re concerned about developing RSI from having to do all this tworganization (yeah, I went there) across your desktop, notebook, and i-device, TweetDeck’s got you covered. For the iPhone release, TweetDeck introduced an account system that lets you sync your groups and columns between devices. However, TweetDeck’s UI is a little strange and cluttered, with many ways to access the same function (such as switching columns), and an abundance of needless audio feedback. A handful of TweetDeck’s other key features are missing from the iPhone version, including the ability to cross-post to Facebook as well as some specialized groups like StockTwits, and more in-depth stats from Twitscoop.com. TweetDeck runs on any iPhone or iPod touch with the iPhone 2.x software update installed. It’s a free download.